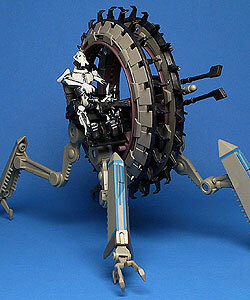 Comments: General Grievous' wheel bike is a custom-designed mobile attack vehicle. He sits in the center sphere, and the wheel revolves around him in driving mode. The four legs are used in walking mode and to climb vertical surfaces, such as the sinkholes on Utapau where he battles Obi-Wan Kenobi on Boga. Also included with this vehicle is an ROTS Product Catalog that shows other toys in the Revenge of the Sith.